Hi friends, in this article, I am discussing about the air circuit breaker working principle and construction. I hope it will be very helpful for you. Risk of fire and maintenance associated with the use of oil is eliminated. Mechanical stresses that set up due to gas pressure and oil movement are eliminated. The cost of regular oil replacement due to deterioration of oil with successive breaking operation is absent. In the air circuit breakers, the arc is extinguished by increasing its resistance. The arc is lengthened with the help of arc runners and arc chutes and its resistance is increased by cooling, splitting and lengthening. In this type, contacts are made in the shape of two horns. The arc initially strikes across the shortest distance between the horns and is then moved slowly upwards by the convection currents caused by heating of air during arcing and interaction of magnetic and electric fields. The arc expands from one tip to the other when horns are fully separated. This results in lengthening and cooling of the arc. These circuit breakers are used up to 500 V and low power circuits because at higher ratings, the arc may spread to adjacent metal parts. In this type circuit breaker, arc extinction is achieved by means of a magnetic field produced by the current in blow-out coils connected in series with the circuit being interrupted. The magnetic field moves the arc into arc chutes where the arc is lengthened, cooled and quenched. The breaking action of such breakers becomes more effective with large currents. Therefore, these circuit breakers are used for high rupturing capacities. Construction of air circuit breaker (arc-chute type) used for low and medium voltage is shown in the figure. There are two sets of contacts in such breakers named as main contacts and arcing contacts. Main contacts are usually made of copper and carry the current in the closed position of the circuit breaker. They are silver coated to make low contact resistance. The arcing contacts are hard, heat resistant and usually made of a copper alloy. Arcing contacts are used to reduce the damage of main contacts due to arcing. These contacts can be replaced easily. 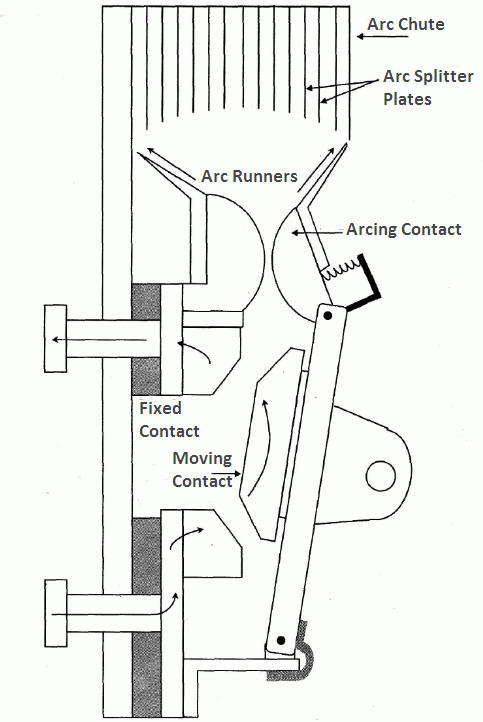 The arcing contacts close before and open after main contacts. Here blow-outs consist of steel inserts in the arcing chutes. These are so arranged that the magnetic field induced in them by the current in the arc moves it upward faster. When the arc comes into contact with the cool surfaces of the steel plates made in arc chute, it gets rapidly cooled. Thus the arc is quenched by lengthening and excessive power loss. The main problem in this type of circuit breakers is inefficiency at low currents where the electromagnetic fields are weak. On the occurrence of a fault, main contacts separate first and the current is shifted to the arcing contacts. Now the arcing contacts separate and the arc is struck between them. This arc is pushed upwards by the electromagnetic forces and thermal action. The arc ends travel along the arc runners. The arc is split by arc splitter plates. The arc is quenched by lengthening, cooling and splitting. These circuit breakers are employed in AC circuits as well as DC circuits up to 12 kV. Such circuit breakers are usually of indoor type and installed on vertical control panels. As they have no oil, they are recommended where there are possibilities of fire and explosion. Thanks for reading about “air circuit breaker working principle and construction”. © https://yourelectricalguide.com/ air circuit breaker working principle and construction.